1/24 scale, AOD32011 - $16.99 plus postageAvailable online from Aviaeology's website. 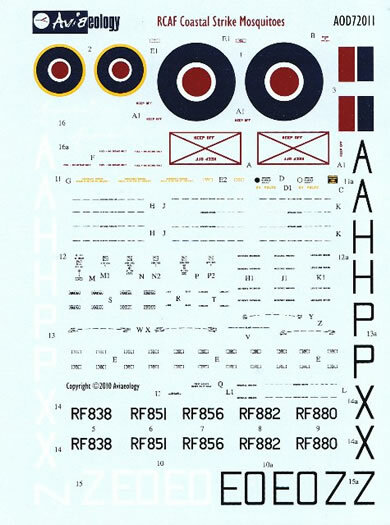 Informative instructions; 9 period photographs of the aircraft including close-ups of the rocket projector installation; scale plans of the R/P for Coastal Strike Mosquitoes; decals with very thin carrier film and colours in perfect register; compliment of stencil data. A well thought out product that clearly understands the needs of the modeller. Not only do we get a quality set of decals but also the information to understand the changes needed to portray the aircraft illustrated. This release from SkyGrid Studio is a real treat for “Mosquito” lovers. It’s a special edition sheet that would normally cater for 3 aircraft. There is a bonus however as “Canadians in Coastal Command #3” comes with additional markings for a further 2 subjects, but more on this later. They are all from 404 Squadron RCAF and present an interesting alternative to those options offered by kit manufacturers. Mosquito FB.VI, RF838, as aircraft EO•A of 404 Squadron RCAF, RAF Costal Command, Banff, Scotland, April – May 1945. Mosquito FB.VI, RF851, as aircraft EO•H of 404 Squadron RCAF, RAF Costal Command, Banff, Scotland, April – May 1945. Mosquito FB.VI, RF882, as aircraft EO•Z of 404 Squadron RCAF, RAF Costal Command, Banff, Scotland, April – May 1945. These were fitted with rocket projectiles but that shouldn’t put you off. There is an article included that shows you how to replicate the Banff Strike Wing’s late R/P setup. This comes with 1:12 and 1:24 scale drawings as well as close-up photographs of the original installation. The bonus aircraft come in the form of extra codes and serial markings. These represent a couple of machines flown by W/C EW “Teddy” Pierce. This is Pierce’s aircraft as seen during the squadron’s work-up period. The older shrouded exhausts could be seen until they were slowly converted to the open stack type. Initial photos show the R/P rig yet to be installed and it appears the 50 gallon drop tanks were used for training purposes. This machine was flown on the squadron’s last combat sortie of the war where they set off to engage enemy shipping. No images of this plane were found by the manufacturers so the finish is based on other aircraft in the same serial range. Hence we are referred to RF882 for details. The smaller scales of these releases carry a full complement of stencil data. Although this replicates many of the items in a kit, the ones presented here have distinct advantages. The colour registration is perfect and surrounding each item is some of the thinnest carrier film in the business. It is kept to a minimum around each transfer and virtually disappears under a protective coating of your favourite finish. Obviously the 1:24 scale offering is intended for the Airfix release. Due to size constraints, the data in this set concentrates mostly on adding a few modified and missing items. The placement guide is excellent and lets you know where everything should go. Another plus is the section on “Coastal Mosquito Colours”. It describes the two-colour Night Fighter and Special Coastal Duties schemes as well as the apparent ad hoc application found on 404’s aircraft. 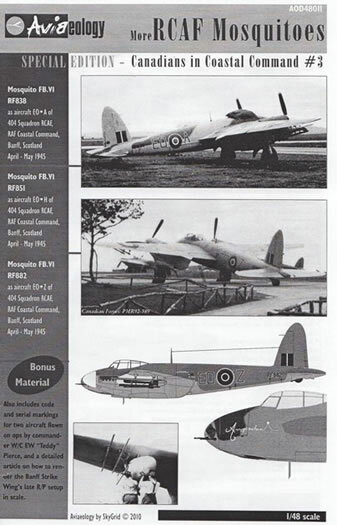 For those modellers that want something a little different in their collection, a Mosquito from 404 Squadron could be just the trick. 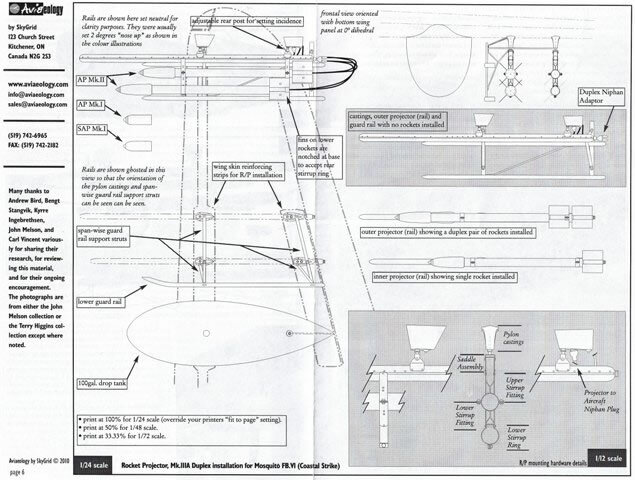 All of the information necessary to build one of these aircraft is contained on the informative instruction sheet as well as a listing of references for further study. The quality of the decals is first-class and the inclusion of the stencil data is always a welcome bonus. As such it’s a package highly recommended for “Mosquito” fans.